Harry, Jojo, Miani and Reka speak with Sophie Whitehouse about the 'You Can Sit With Me' program that is changing young people's lives. 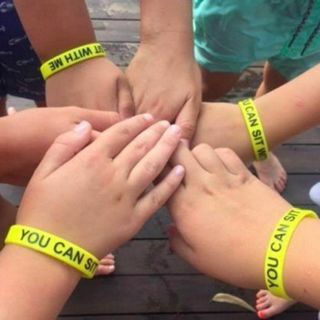 This is an excellent initiative where students wear a bright yellow wrist band to let anyone who is feeling left out or bullied, that they can turn to one of their peers for support. Sophie runs an educational consultancy group on teaching practices and has over 25 years of teaching experience in the United Kingdom and Australia, Ethiopia, ... See More Canada, Singapore and Hong Kong where she has been working with children of varying ages, races, religions and educational needs – a journey that led Sophie to understand the issues surrounding bullying and its impact on young people. Sophie’s concern and research into the isolating impact of anxiety, depression and loneliness led her to create You Can Sit With Me in 2015, to combat the impacts she saw as an educator and educational consultant around the world, with the intention of changing lives with a wonderfully simple measure.